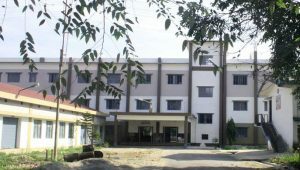 Falakata Polytechnic – Baganbari, Falakata, Dist- Alipurduar, W.B. Falakata Polytechnic began its voyage under the umbrella of Department of Technical Education & Training, Govt. of West Bengal from September, 2001 at Jalpaiguri Polytechnic Institute, initially with two trades namely i) Food Processing Technology and ii) Electronics & Tele-Communication Engineering with a intake capacity of 30 each. It took nearly two year to set up a temporary establishment at Falakata Community hall. On 10th of September,2003 the Polytechnic started its functioning from the soil of Falakata itself. On the 19th July ,2008 Falakata Polytechnic re-shifted to present campus at Baganbari. From the inception till date the Polytechnic has grown many folds. With the construction of new class rooms, workshops, canteen building new courses like Civil Engineering, Mechanical Engineering and Electrical Engineering was introduced in the present campus. The Falakata Polytechnic is surrounded by lush green cultivation fields with crystal clear water of the river Balatorsha flowing by the eastern side of college building. The mountain ranges of Bhutan is clearly visible on cloudless days in the backdrop. The college surroundings are home to many rare birds and animals.